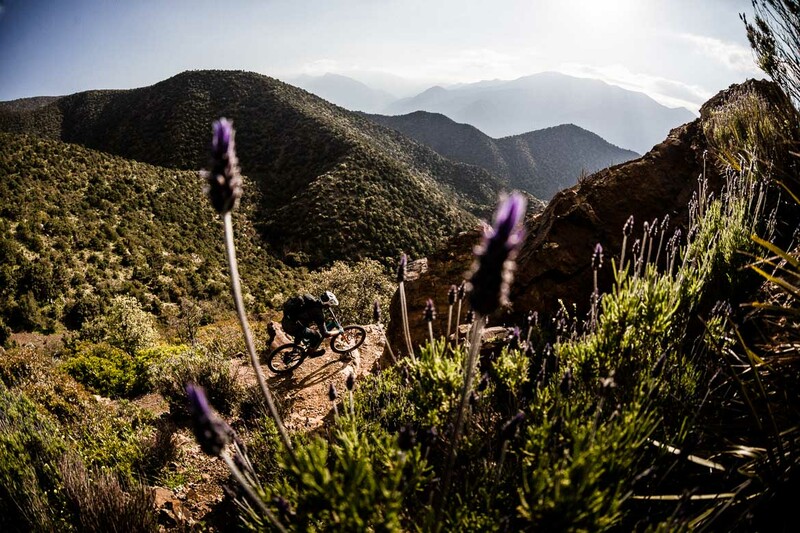 Get a taste for the latest addition to our tour portfolio as we traverse the High Atlas Mountains, Mountain biking Morocco style. Awakening to the morning prayer call reverberating around the mountains I wobble to the window where the world is beginning to stir. The sun is painting the peaks orange whilst puffs of smoke rise from the huts below into the sharp morning air, suddenly all falls silent once more. 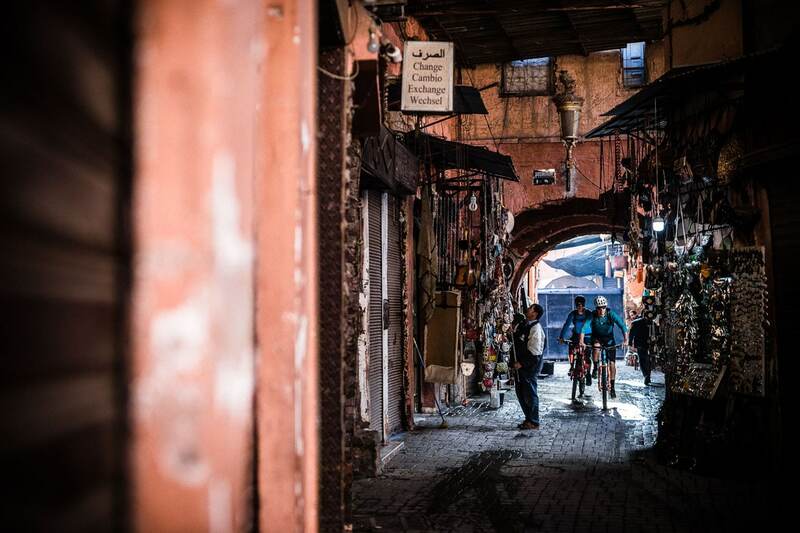 As enthralling and enchanting as Marrakech was with all the hustle and bustle and its deeply ingrained culture, this was the side of Morocco I’d come to see. My companions for the trip were Eric Porter and Euan Wilson, both of whom have had their fair share of adventures into the unknown. Luckily we had local guide – and soon to be friend – Lahcen at our disposal. 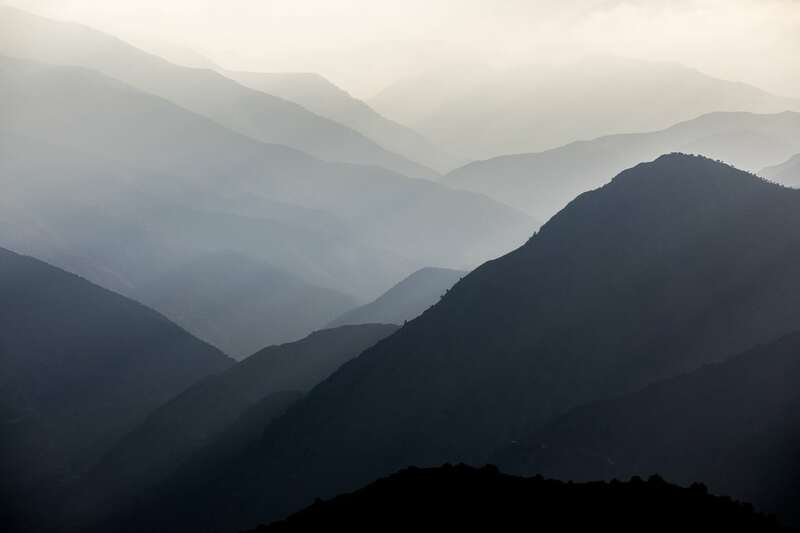 He knew the remote routes through the Atlas Mountains like the back of his hand. 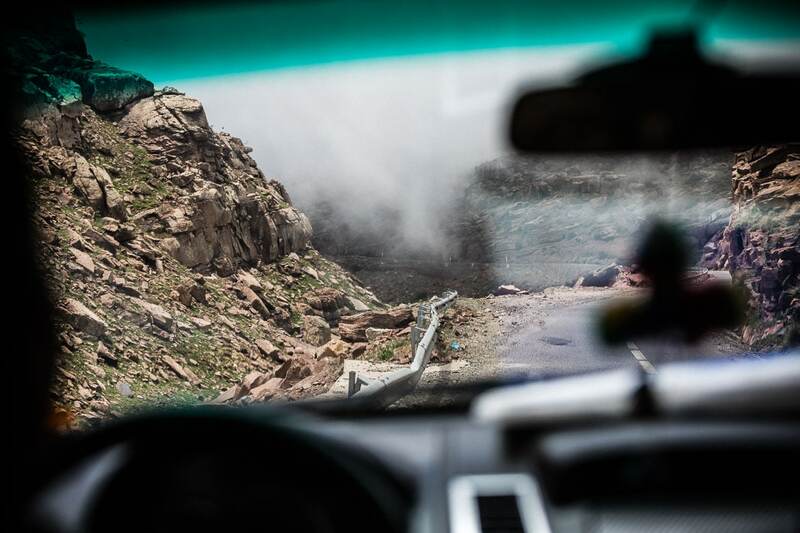 Dodging chickens and cats we hit the dirt roads of ‘downtown’ Imlil where the locals are going about their morning commute and grocery shopping. Just outside of town we meet a couple of local men and their unperturbed pack mules, onto which we pack our bikes either side before they begin their stern march upwards leaving us in their dust and hoof prints. 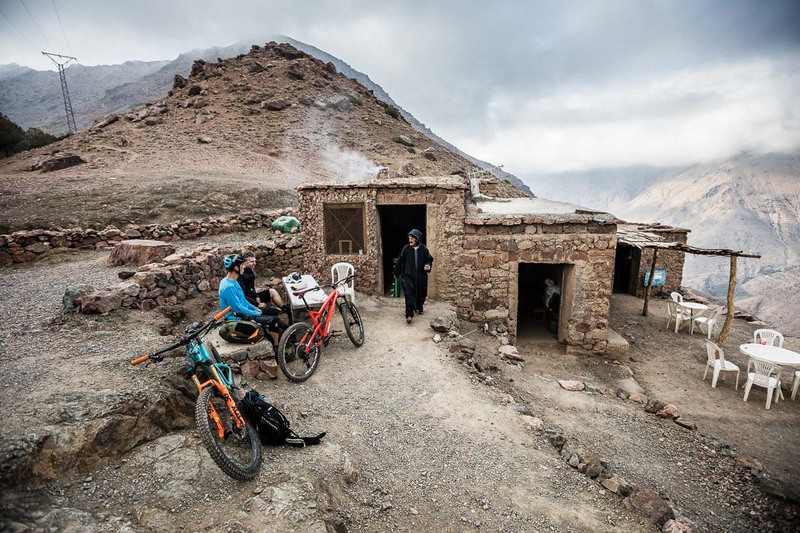 The native Moroccan nomads, called Berbers, may have used mules as transport for both themselves and belongings, but we find them to be just as capable for carrying our bikes. By the time we’d reached the top the mules had dumped our bikes and were already scrambling back towards Imlil, leaving us to enjoy mountain biking Morocco undisturbed. The high pass offers us a vantage point onto our trail running into the valley below, a tiny scar in a range of towering ridge lines and textured scree fields. 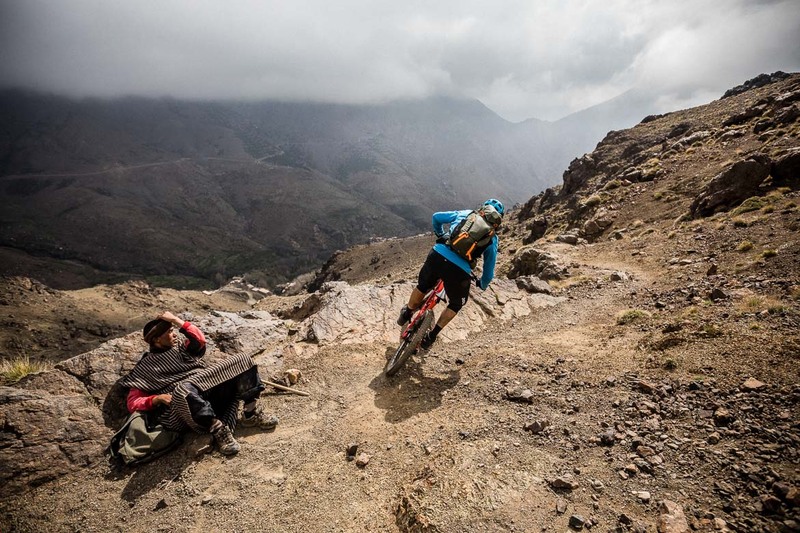 Following in the tracks of the Berbers before us we cling to the narrow trail cut in by the passing of feet and hooves, attempting to ignore the drop to oblivion on our right hand side. Bobbling over fiery red boulders that ping from beneath our wheels the trail surface changes suddenly to a silver sheen, both grippy and slippery in equal measure. As we fall in gradient our surroundings become less lunar and increasingly lush, the trail becomes less exposed, allowing us to switch focus from survival to satisfaction. 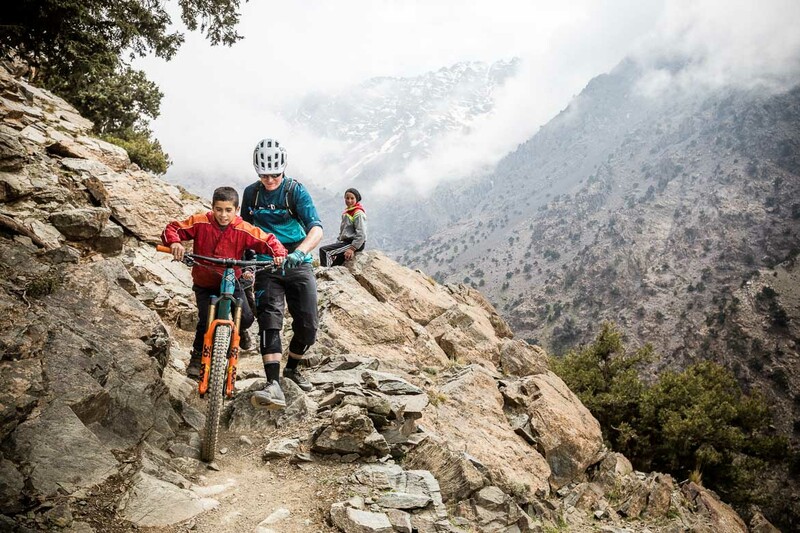 Under the watchful eye of a trio of local youngsters we pick our way down a rocky staircase before stopping at a mountain refuge where Lahcen begins chatting to the owner. Seconds later mint tea is being poured from a height. This stuff is like rocket fuel, with a sugar content so high you can feel the enamel stripping off your teeth as you drink it. Bloody good though… It doesn’t take long for us to discover how warming, hospitable, and generous the locals are. Passing through terraced farmland we drop into some urban singletrack, through a mountain village, which is even more technical than what we’d ridden previously. With the locals watching on we soon have a procession of kids chasing us through the alleyways like we are the lead riders in the Tour de France. Quite the contrary in reality. Our path is then quite literally interrupted by some ‘road’ works, or rather road construction. 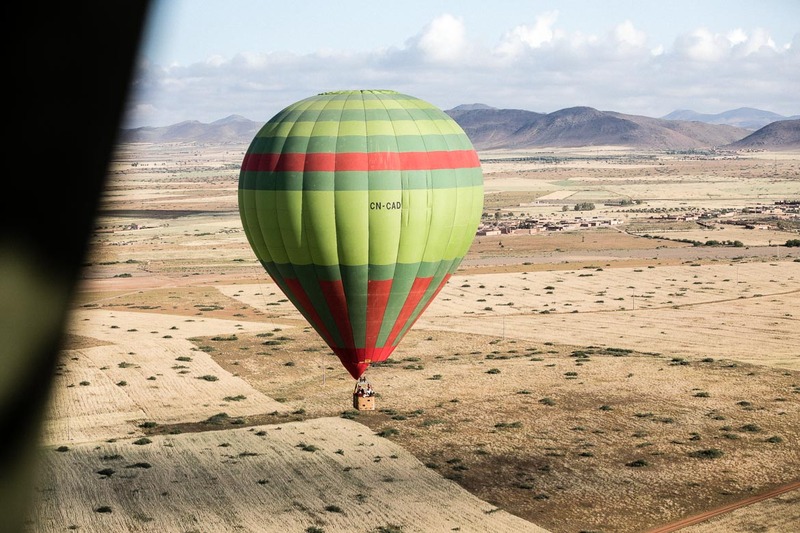 This inaccessible corner of Morocco isn’t going to be inaccessible for too much longer… A shame, at first thought, but then again why shouldn’t local people have the same infrastructure, or at least a slice of which so many others have? It is human nature after all to evolve and adapt to an ever changing world. Food for thought as we hit the more established civilisation of Ouirgane for the evening. Half asleep we roll out from the accommodation and straight into a playground of red earth sculpted by mother nature. Eric is instantly in heaven, cutting and popping wherever he wants on the smooth contours. 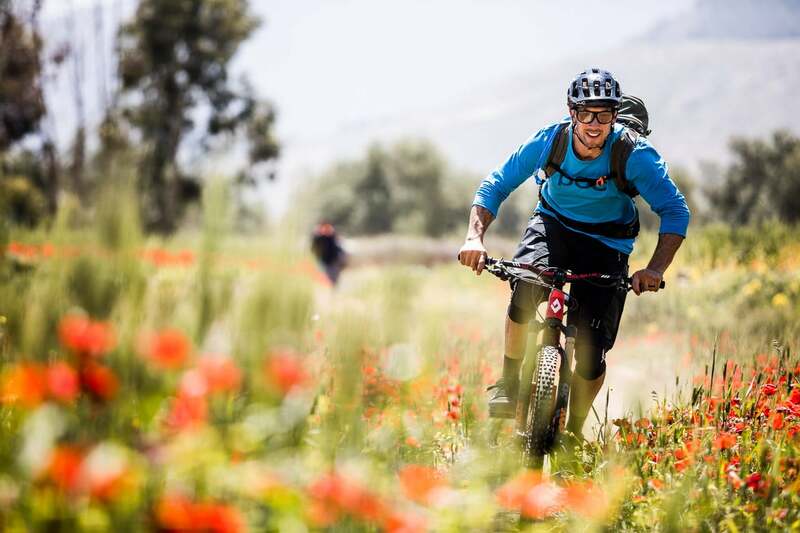 With the crossing of a lake atop a dam we transition from the red into the green and a surprisingly rich and fertile environment, something I hadn’t envisaged when mountain biking Morocco. Surfing between fields of poppies we funnel down narrow gaps in the stone walls which are topped with sharp thorns to keep livestock out, they acted as pretty good mountain bike deterrents too. 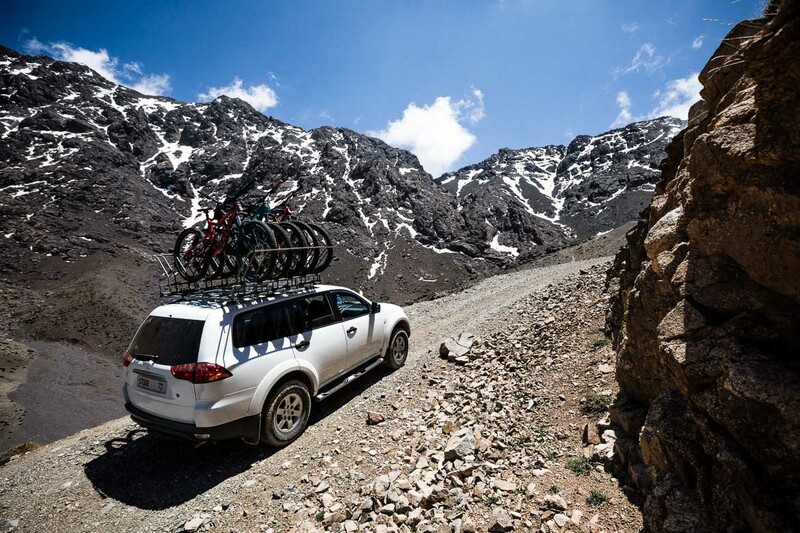 After a unanimous decision to shuttle up the 1000+m climb we meet up with the trusty support vehicle and load bikes. 30 minutes later we are looking at each other in relief as we pass a straggling and fragmenting group of riders suffering at each pedal stroke. I almost feel bad, for all of 5 seconds, as we power past them. In that spike of altitude we are thrust right back in amongst the big mountains. 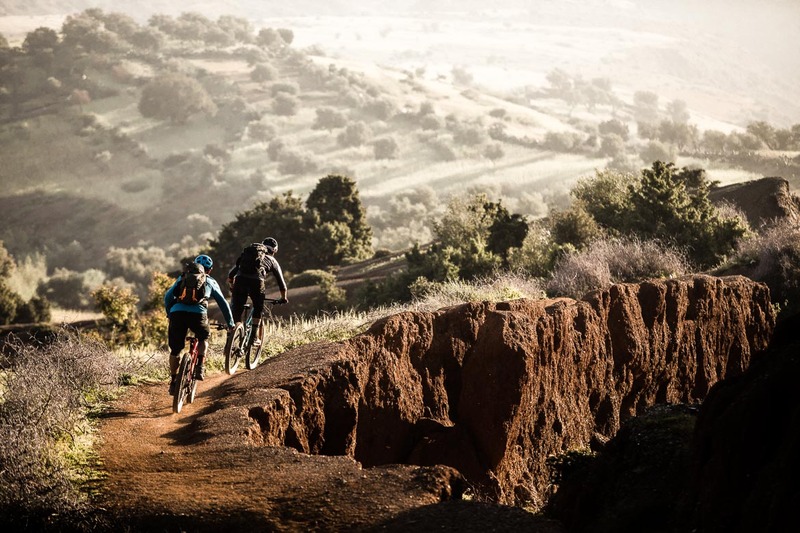 Everyone is raring to go after lunch as we begin to crank towards the imposing peaks, darting through dusty farmland singletrack which rises and falls through the terraced fields. Pulling up at a rather dilapidated farmstead we find two shepherds tucking into their lunch, they immediately engage Lahcen in friendly conversation before offering up a portion of their bread and tea. With a smile and a wave we depart, hitting some beautifully flowing turns that seem somewhat out of place. It was as if they’d been built with two wheels in mind, rather than simply a route for getting from A to B. Our evening’s destination comes into view; a cluster of houses surrounding a mosque nestled between the hills. It’s a satisfying feeling plotting a point-to-point route on a map and staying somewhere fresh each night as we follow the tracks of the nomadic Berbers before us. It doesn’t take us long to plunge into the maze of tight alleyways where we are ushered through a wooden gate into a walled garden. 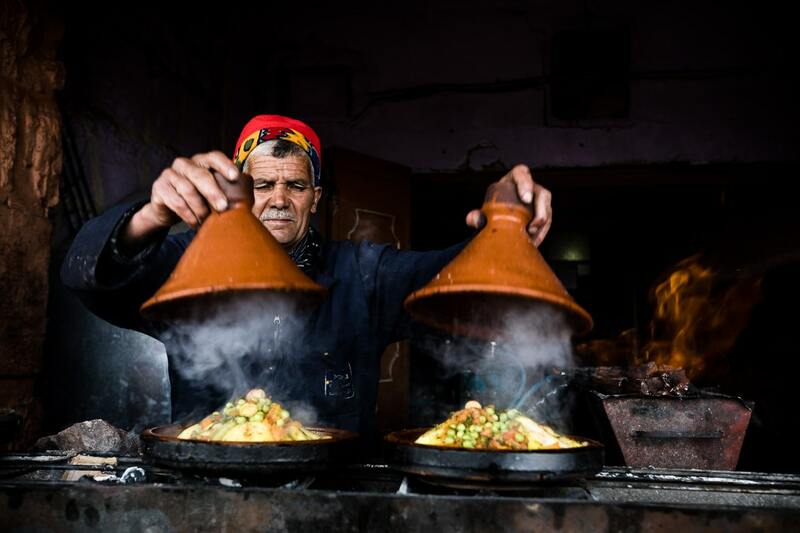 Oranges cling to the branches, colourful throws line the surfaces, tagine pots simmer on the embers. We aren’t exactly roughing it in the mountains. 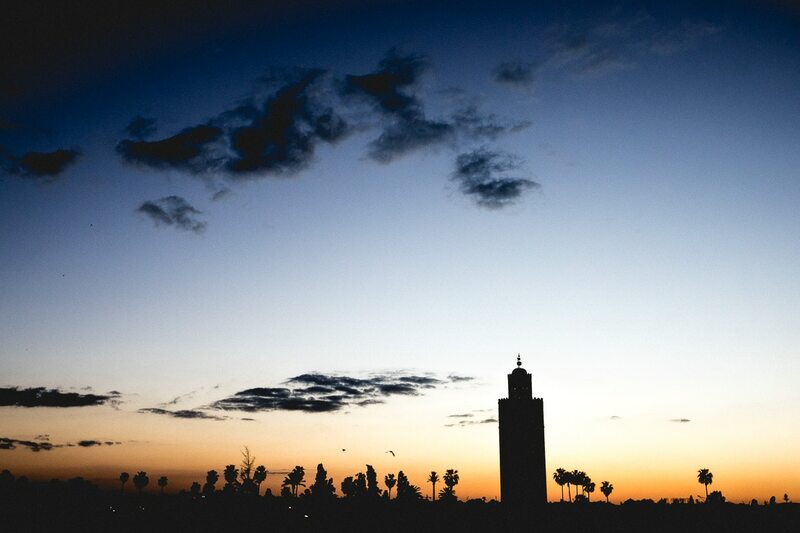 By now I’m used to the involuntary alarm clock as the early morning prayer call billows from the mosque tower next door. 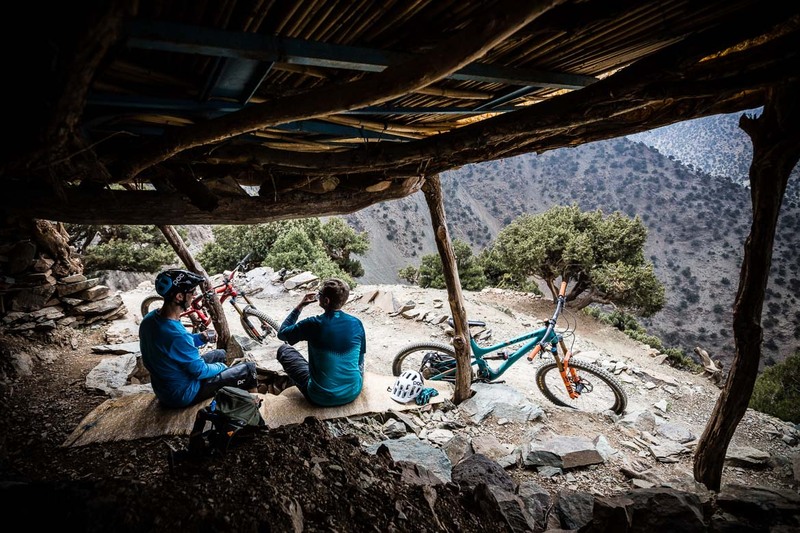 It seems everyone else has had the same idea as me as we huddle round the breakfast table before first light, on the map we scout out our route back out of the mountains which will eventually take us to the flatter plains that stretch out towards Marrakech. Leaving the orange and red of the village architecture behind we settle in for a long day in the saddle, funnelling into a canyon where overhanging clifftops perilously dangle above us. It almost feels like bandit country, I’m half expecting to round a corner and see a couple of cowboys on horseback careening towards me. Clawing at the pedals and torturing cassettes we switch back and fourth through the heart of another village clinging to the mountain side. Eventually the road fizzles out and spits us into a ravine on the surface of Mars. As we summit the pass we shuffle in front of a mule before it begins plodding downwards. Our route zigzags out of sight, hidden by the spurs of the valley sloping down from each peak. As we press on down the traverse tyres squirm for grip on the ball bearing like surface. Rounding each of the valley’s overlapping layers is like turning a page in a book, the plot keeps chopping and changing, only luring us in further. I pull up by a gnarled old tree that seems to be twisting its way skywards. Gazing back I track Eric and Euan snaking their way across the face; two dots adrift in a vast vista of orange earth and baby blue sky. Threading the eye of the needle through craggy rocks, another seemingly perilously perched village comes into view. We leave the harsh afternoon sun briefly and crank subterranean below the houses before diving left and following the course of a dormant river bed that eventually drains us back to the support vehicle once more. Bodies and bikes sway from side to side as the truck jolts, clawing for traction up the steep ascent. Just as I’m about to nod off the side door is flung open and the sun floods in, peering out reveals layer upon layer of crisscrossing mountain ranges fading into oblivion. Back in the saddle we are darting through sharp undergrowth that, given half a chance, would like nothing more than to claw you off your bike. This is one of the greenest environments we’ve ridden all week, the lake below shrouded in lush vegetation offering a clue as to why. 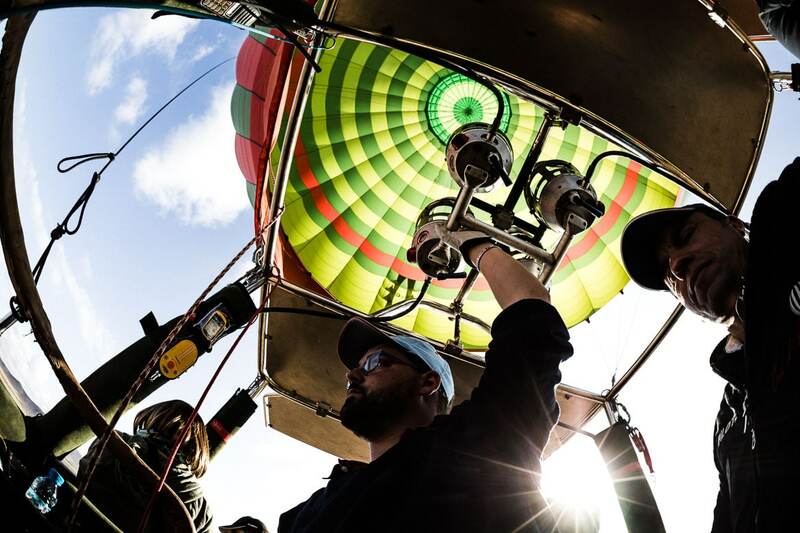 Flicking left, flicking right, holding it wide open and letting her run ragged on the straights; we are on the most direct route off the mountain but that certainly doesn’t mean the descent is finite by any stretch of the imagination. 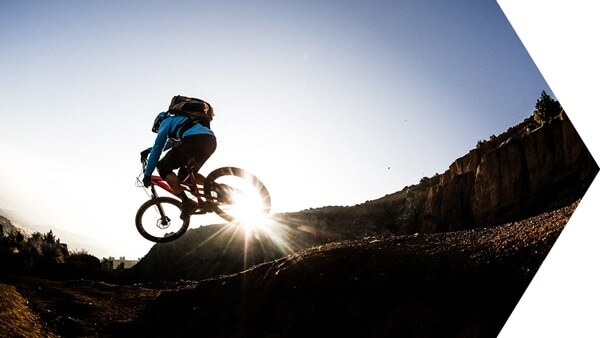 By now each imperfection on the rugged trail surface can be felt in the core of your hands. 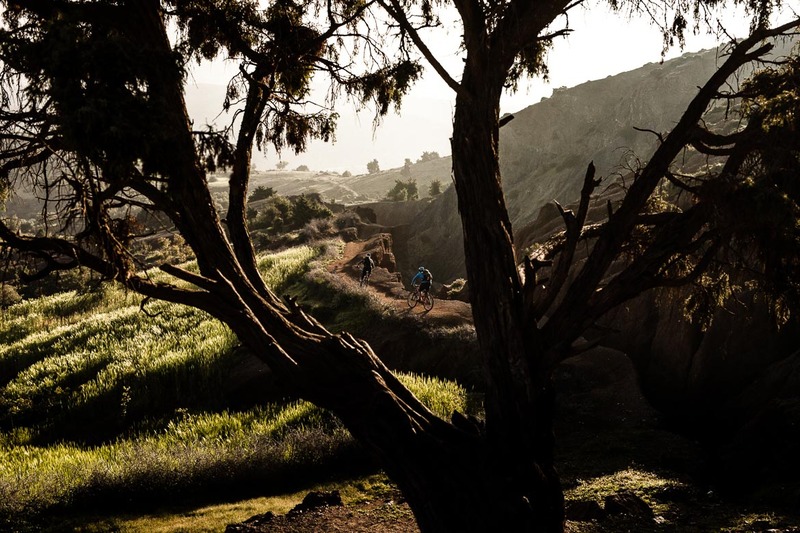 The sun has all but departed bar a few lazy rays that loiter as long as they dare, we race nightfall back to the familiar rural setting of Ouirgane which sadly means that the curtains are about to close on our riding time mountain biking Morocco. The trip had felt both long and short in equal measures. 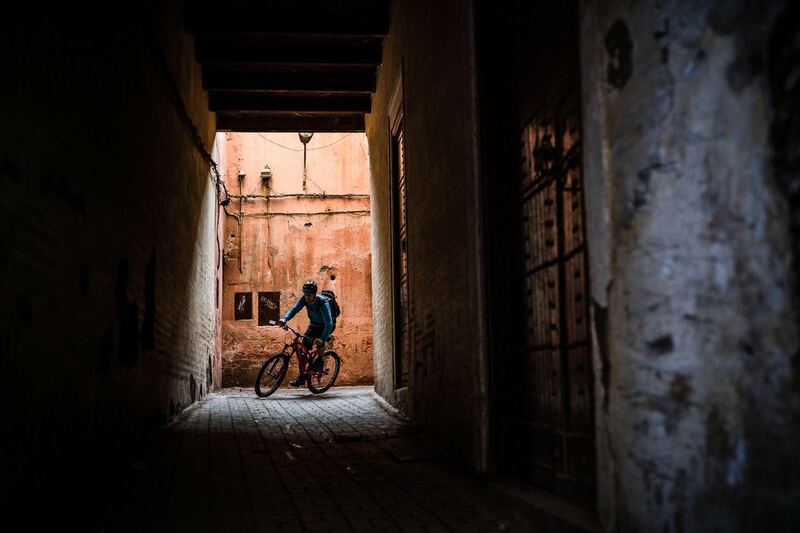 Sauntering through Marrakech’s bustling markets felt like a life time ago, but I can still hear the vendor’s yells loud and clear… and the prayer call which I found almost haunting at first will continue to ring in my mind whenever Morocco is even so much as muttered. My lingering impression from the time is of a warm, generous, and hospitable nation steeped in a rich culture, where two wheels are the perfect vehicle for total immersion.